I’ll be interspersing reports from DPC with ECTC and ICEP reports so pay attention as to where the material over the summer is coming from. In addition I will be covering ConFab and Semicon West so there will be a lot of information coming your way. We are finally getting around to taking a look at the March IMAPS Device Pkging Conference. Actually it is officially listed as a workshop, which to IFTLE is inappropriate since it runs 3 parallel sessions for 2 ½ days and has a very large exhibit tied to it. It seems the driving force to not change is that SOME don’t want to write up their papers for a proceedings which would be required if it were officially a conference. These are probably the same authors who don’t ever hand in, or take 2+ months to turn in , their slides. When I was general chair I tried twice to require a proceedings and was voted down twice, so don’t blame me ! In the end its all about literature searching. We all have become so accustomed to using Google scholar that if it doesn’t show up there we just ignore it. If I don’t have a copy of a specific proceedings and its papers don’t show up in Google Scholar basically the material does not exist. Sure I can go to each societies web page, and become a member and then search their archives but how many of us do ? Right now that means we all reference quite a bit of literature from IEEE explore because Google indexes it and our companies / institutions pay to access it. Other societies need to make sure their material is archival and searchable otherwise after a few years it is really lost. I know IMAPS specifically is working on this problem and I hope all the other societies are too. Lets start our DPC look with presentations from Amkor. Being close by in AZ, Amkor always brings a strong contingent to the DPC. 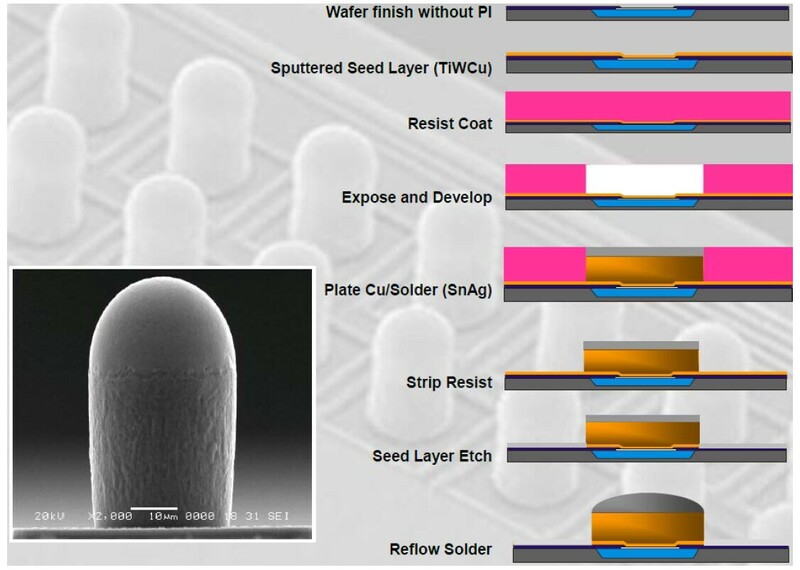 The assembly process for thermocompression bonding with non conductive paste (TCNCP) is shown below. Key to the assembly process is control of the peak heating temp and the heating time. Amkor also discussed mold shrinkage and die stress effects on FC molded BGAs. FCBGA can be molded using either mold compound or molded underfill. Schematic of molding is sown below. Increased shrinkage increases both tensile and shear stresses. Stresses are concentrated in the mold/ die interface in the mid section of the die. The rubber insert used to protect the die surface creates a grove in the top of the molded surface. This grove controls the stress on the overall package and this package warpage. 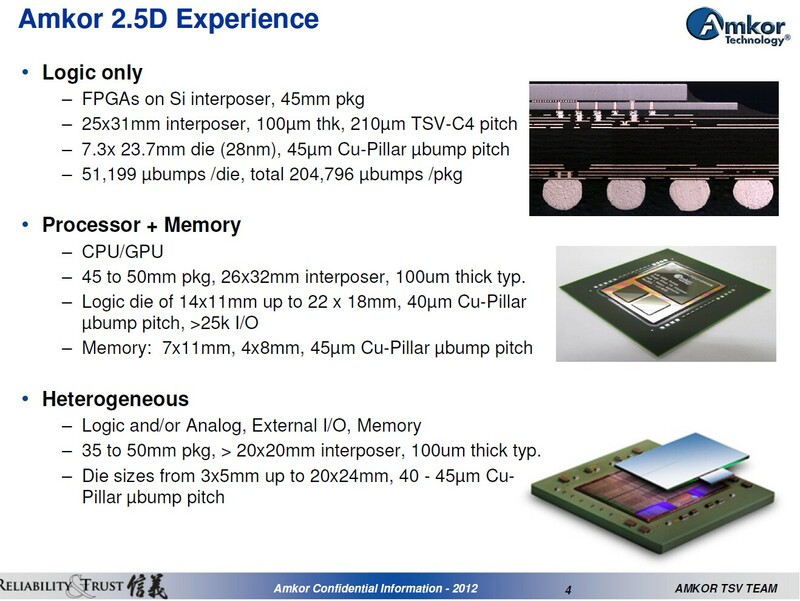 Kelly of Amkor discussed “Assembly challenges for 2.5D”. 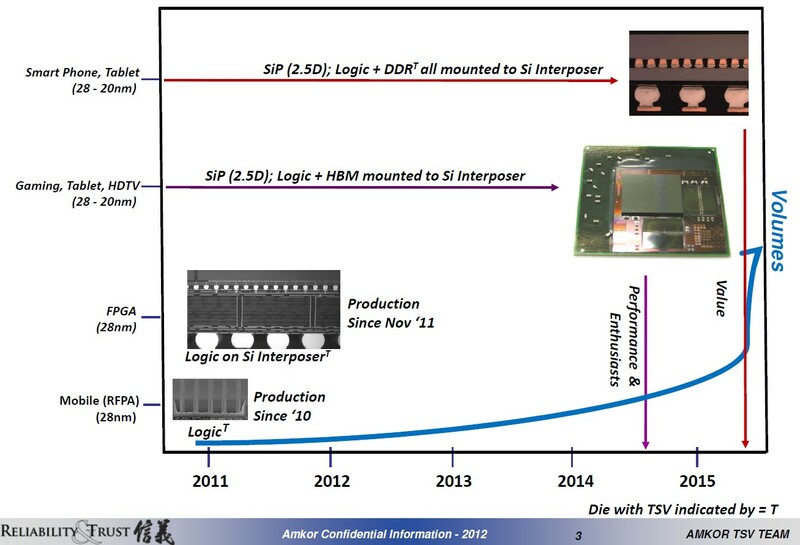 Their latest roadmap now shows memory + logic modules pushed back to the 2014 – 2015 timeframe. Amkor has been engaged with > 10 top tier customers with > 20K parts built. There has been a large package focus (> 40mm) . 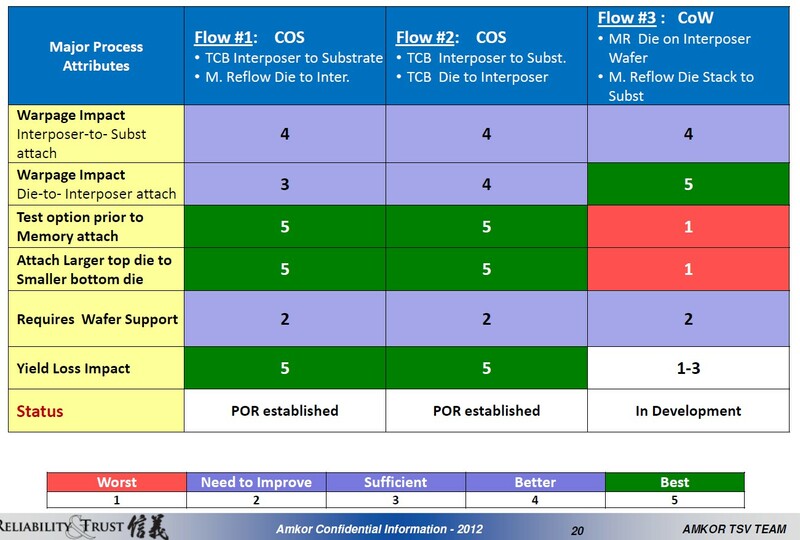 While the slides showed interposers from 3 different “foundries” upon questioning they admitted that TSMC is delivering and the other two (Global and UMC) are close. - Their copper pillar bump process is on 40-45um for most customers roadmaps. - for die joining mass reflow is preferred but warpage must be well under control. TC bonding is an option for higher die warpage. TCNCP can be used for small die and CUF for larger die. - Interposer top side to bottom side die interfaces must be flat in order to assemble. - Need to know top side stress on incoming wafers in order to properly assemble.